Students walk off the Lakefill on Saturday afternoon. Dillo Day, the annual musical festival, was canceled due to bad weather. Dillo Day was canceled Saturday due to high winds. The annual musical festival on the Lakefill was shut down because of bad weather before any main stage artists were able to perform. The 30 mph winds surpassed the wind tolerance level for the main stage, University Police Deputy Chief Dan McAleer said. Officials consulted with the vendor for the WNUR stage, a smaller stage that would have featured up-and-coming artists, to see if the main stage artists could perform on his stage, which had a higher wind tolerance level due to its size, McAleer said. However, the stage vendor also said the winds were too strong and his stage needed to be shut down. “There was also no guarantee that the artists would be willing to perform on either stage due to the weather conditions,” McAleer said in an email to The Daily. 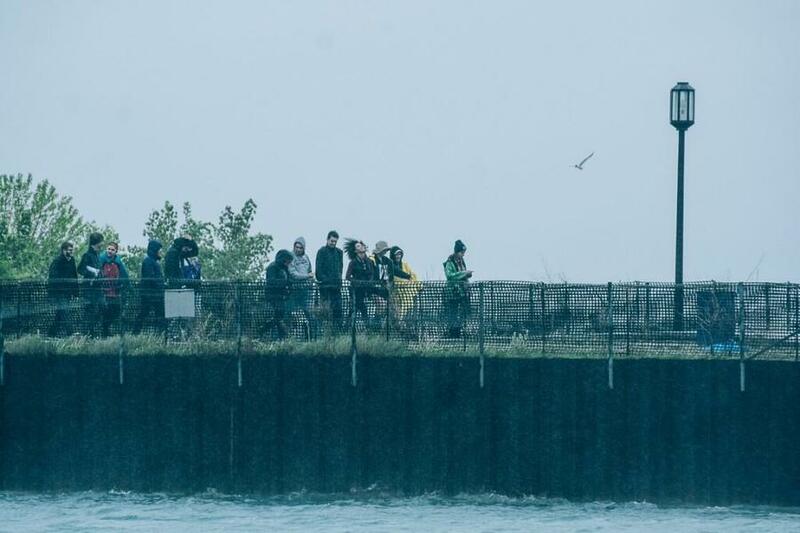 Mayfest released a statement on its website Sunday, saying the group is “devastated.” The statement said NU and Evanston officials and the stage production vendors made the decision to close down the festival. Mayfest said the rain and the cold temperatures did not play a role in the event’s cancellation and at no time did the Lakefill need to be evacuated. The statement said the group works to find contingency venues, but Welsh-Ryan Arena was unavailable due to a prior event reservation and there were no other indoor venues that could accommodate Dillo Day. “There is always a risk when planning an outdoor music festival, and yesterday we were very unlucky,” the statement said. Additionally, Mayfest said the group is unable to give refunds for wristbands, as it standard practice for Norris Box Office to not issue refunds. This year, guest wristbands cost $10 for students’ guests, as well as graduate students, alumni, faculty and staff. Mayfest announced the festival would not go as planned around 3:40 p.m on Saturday. Miguel was scheduled to headline the festival, which would have featured Odesza, Charli XCX, A$AP Ferg and Saint Motel. This post was updated at 6:06 p.m. Sunday with additional information from Mayfest and University Police. Visit “Captured,” The Daily’s photo blog, for more Dillo Day photos.